Why do we still look to the wisdom of George Carlin today in memes and videos? Because his comedy was timeless. What worked in 1988 is still topical in 2017. 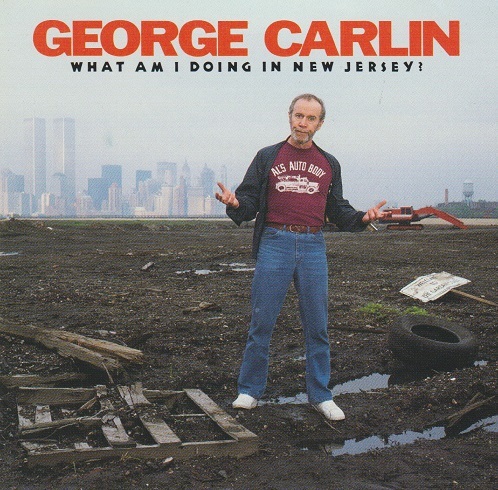 On the government, Carlin blasts: “They’re against street crime, unless the street is Wall Street!” Still true, just change the names. Listen and you might even learn something, but you’ll be too busy laughing to realise it. It’s actually incredible how applicable this 30 year old comedy show is. Freedom of choice, freedom of speech, government telling you what you can and can’t hear. I don’t think George Carlin would think much of the year 2017. What is most appealing about George Carlin’s comedy is simply how he observes the absurdities of life. If he makes you uncomfortable, that’s too bad, because the rest of us are laughing. It’s not all topical observations. Sometimes it’s helpful advice. “Here’s one to try. Go in to a gift shop, and ask for your gift.” You’ll also enjoy his list of people he could do without. “A proctologist with poor depth perception.” True, true. “Anyone who mentions Jesus more than 300 times in a two minute conversation.” Yes, yes. “A brain surgeon with ‘born to lose’ tattooed on his hands.” Dear God yes. And…”couples whose children’s names all start with the same initial.” Say no more, my sides hurt! The last 20 minutes of the album is dedicated to “More Stuff About Cars and Driving”. From this, I gather there are many toll roads in the state of New Jersey. 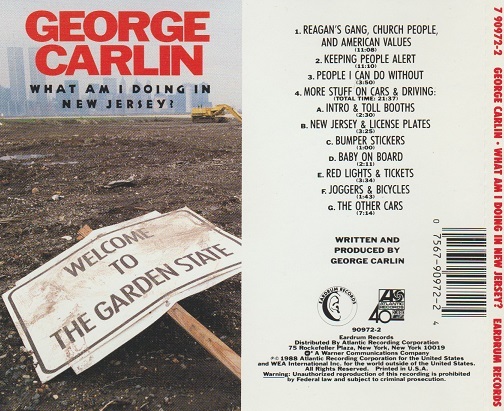 Carlin goes after bumper stickers too. Imagine what he’d think of today’s window sticker families! Not for everybody, but possibly just what you need. One of the few comedians that deserved all the praise they got. There’s something truly special about turning observations into comedy. You wouldn’t quite believe it if it wasn’t so funny. One of the greats. He was one of the best. If he were still alive, the amount of material he would have with today’s government and society would be endless. His humour would have been appreciated in today’s world. Can you imagine what he would have to say about Trump? Jeff Sessions? Roy Moore? Steve Bannon? Al Franken? There’s nobody quite like him today. Love Carlin. My big take away from him was always kicking against the dummies. He just wanted common sense and effort from people. Sadly, he was given a lot of material from the people who can’t be bothered to try.